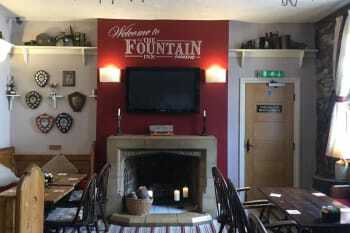 The Fountain is a charming, traditional 200 year old village pub in the heart of the Forest of Dean, offering bed & breakfast as well as self-catering group accommodation in the Fountain Lodge. We provide a welcoming atmosphere to both locals and visitors to the area, with the Dean Forest Railway bringing steam trains almost to our door. 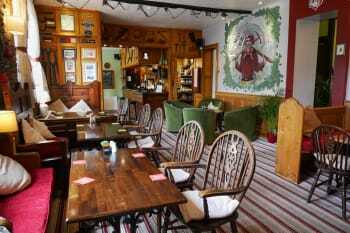 Step into this atmospheric country pub to see an incredible range of interesting artefacts and tools filling every corner, with many relating to local crafts and history. Or try your arm at the local game of Quoits. Our aim is to provide a warm welcome to all of our visitors. Children, dogs, cyclists and walkers are all well catered for, both inside and outside in our beer garden. 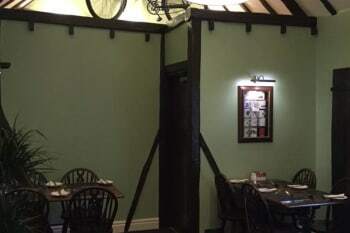 The Fountain Inn also has step-free disabled access and facilities. We serve a number of real ales and our extensive menu features locally-sourced ingredients wherever possible. We have a range of bar snacks, baguettes and meals available with food served in the pub or our dining room. Pets: Pets are allowed at a charge of £4.00 per day. very friendly and helpful staff, excellent service, GREAT food. food excellent here. Steam railway very close, Village has a lot of history and walks if you are into wildlife Park End is a great centre. Was an excellent stay, thank you. More than anything, so impressed with all the staff. So much in the area! Parkend a great village - we went to all three pubs (inc the Rising Sun) - all so welcoming. Great location - walk out in any direction. Absolute heaven for dogs too! My second visit and very satisfied in all aspects. Ride the railway, walk the Forest. Very comfortable bed and good food with friendly staff. Nice friendly staff. Good food. This was my first visit on recommendation from friends and I was not disappointed. The welcome the food, service, staff very nice. The room was clean with everything you needed on tap. Overall an excellent experience. So thanks for making my stay a great one see you again. Good size room with comfortable bed. Lovely breakfast with good choice on menu. Would definitely stay again. Decent room, nice dinner in the pub and a great breakfast. Staff were all lovely and service was excellent. Plenty of parking and very handy location for the mountain biking centre in the Forest of Dean. I'm sure we'll be back next time we go riding down there. Good value. Excellent food. Rooms well appointed and bar restaurant had good decor and agreeable atmosphere? Butty Bach beer lovely. Would stay again. We didn’t need to eat alesewhere but walked up to the Venue in Whitemead Holiday Park for old times sake and entertainment. Location in Parkend in heart of forest fo dean meant we could walk straight out into the fiorest and leave the car behind. Handy for walks in the Wye Valley. Couldn't be in a better setting. Forest of Dean beautiful at any time of year. Fountain staff are very friendly, helpful. Carvery excellent. Puddings delicious: it's very hard to choose just one! Bird watchers would love being here. Lots to watch in the Forest of Dean which surrounds The Fountain. Enjoyed our brief stay in a warm, friendly and clean Inn Hotel. Fantastic little inn with excellent food and super friendly and helpful staff made our short new year eve stay memorable and thoroughly enjoyable! We travelled with our three dogs so the convenient access to the woods at the rear of the inn and the short walk to the local green was just perfect! Beware of dusk though as the evidence of the wild boars in Parkend is obvious so keep dogs on leads or close by . There’s plenty of local walks, nature reserves and ponds ideal for longer walks too . Very enjoyable stay. Dog friendly. Friendly staff and owners. Lovely clean room. Excellent room and very clean. Another enjoyable stay. As always a lovely welcome, lovely room and lovely food. And as always spotlessly clean and superb service throughout my stay. And dog friendly too, fabulous. Thankyou to Michelle and her brilliant team. The local village shop is across the road with a (dog friendly) cafe and another bigger (again dog friendly) cafe just down from the steam train staion, also across the road. A nice peaceful area. Welcomimg staff and excellent food and beer. Room spacious and plenty of storage. Great food, pleasant and friendly staff. Michele & staff are always welcoming,excellent location for walking and cycling. Food is always tasty , breakfast is exceptional & plentiful. Rooms are clean & Nicely decorated. Lots of beautiful walks over tarmac & natural paths, through forest s to mallards pike , There are 4 cafes to get warming drinks & snacks , during your walks. As well as the Fountain, the Woodman Pub is opposite . Very accommodating and charming Inn, rooms very clean and comfortable and plenty of parking. Had a very enjoyable evening in the pub with great food and drinks. Everyone one we met behind the bar and serving the food couldn’t have done anymore. Will be back when in the area. Thank you very much. Cycling , walking and enjoying the scenery. We had a fab stay. Everyone was very helpful. Ideal for our trip as our son was on Whitemead Caravan Park. We had a very comfortable, well-equipped room, loads of cupboard and drawer space. Only niggle was having to move really heavy chairs each evening in order to watch the TV in our room. Staff could not have been friendlier or more helpful. Drinks in bar were a reasonable price, breakfast excellent and there was an extensive evening meal menu - wise to reserve as the tables fill up very quickly every evening! We visit The Fountain st least once s year! Excellent kind friendly service. Good happy atmosphere. Excellent WiFi in the Fountain Inn but little or no mobile reception in Parkend. Steam trains just 100 yards up the road - YAY! Beautiful woods and walks. Friendly, helpful service, good food and drink and excellent location. Looked after us really well - all the staff seemed to be 'in the loop' when it came to sorting out our meals, even when we left it a bit late to book. Staff couldn't do enough to help especially regarding a disabled guest. Couldn't find any tourist leaflets on the premises but perhaps I missed them. A map of the forest would help if made available to guests to keep with them. Would advise obtaining tourist interest leaflets at any of the various locations etc. FofD railway; Speech House; Taurus Crafts. Otherwise, investigate on the FofD website. So glad you enjoyed your stay with us, we do have an large selection of tourist leaflets at the top of the stairs leading to the first floor bedrooms which you would have missed being on the ground floor. Such a shame we didn’t realise you wanted them as we would have been happy to bring you a selection to your room. Hope you found your way around the sites. Friendly, good service. Good quality food. Landlady was fantastic and really made us welcome, room very spacious with great internet, food exceptional. No need to go anywhere else for food it’s awesome, we were only here for one night on business before moving to another hotel which was a pity as the second hotel was a big disappointment and if the Fountain had been closer to our next location we would have continued our stay. Definitely coming back again in future. Room 3 was nice and large with an excellent cupboard / wardrobe. good bathroom facilities with a powerful shower. The bed, however, needs replacing or at least the mattress. Comfortable seating could also improve the room with a small table. The area has plenty of eating places. Parkend has a cafe and three pubs/ restaurants to choose from.if you have a dog with you there is is a wooded area directly behind the Fountain Inn. Lots to do and see in the area whether it is walking, cycling, visiting historical buildings and lovely towns. Gloucester is a superb city to visit. The Dean valley railway would suit any rail enthusiast. 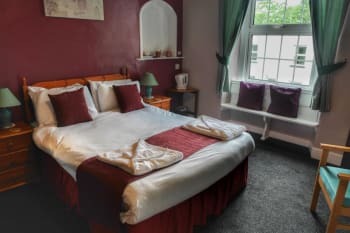 I have stayed at the Fountain Inn several times & always been looked after very well.The accommodation is very comfortable & the food is excellent. Looking forward to returning next year! Seems that everybody from around comes together here at The Fountain Inn! Seems like a "must have been here" Definitely a recomendation! A very comfortable and friendly establishment. In particular, all the staff were very friendly and made us and our Border Collie very welcome. Plenty of outdoor activities and well situated for accessing other attractions in the area. Friendly staff nothing to much bother to sort (cot, highchair). Ideal location for us. Try the loco beer. I lived in the New forest near Lyndhurst for seven years. I like the forest of Dean as it reminds what I enjoyed there are plenty thing to do and interesting walks with the dog. Great place to stay, friendly, tasty food and excellent accommodation. Great steam railway just over the road, forest walks, canoeing and caves. I've stayed at the lovely Fountain Inn several times, always a warm welcome, nice rooms, comfy beds, hot showers. Is really dog friendly with water bowls and treats. All the staff, bar, kitchen and housekeeping are great, always a smile and super service. The coffee is good and the food delicious. Looking forward to my next visit. Nice walk through the woods behind the inn. Across the road to the steam train (dog friendly). Has a museum, shop and cafe at Norchard station. Post office/shop has a cafe and the cycle cafe both 2mins walk are great and both cafes are dog friendly. Taurus craft shops and garden centre in nearby Lydney and a nice park there too. Locally a weak or no mobile signal (forested area) but there are hotspots. Wifi is good though. 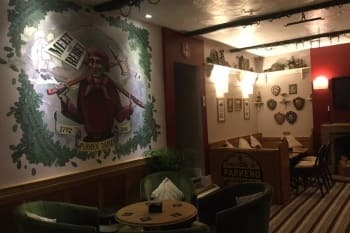 Lovely staff, excellent food, welcoming atmosphere, good location, would highly recommend, will be back when we next head to the forest for a short break. Probably our 9th stay here. Keep coming back for location and top standard rooms. Rather like meeting up with old friends again. The refurb in rooms and downstairs is excellent. We will be returning! We had a lovely stay. The staff are welcoming and very friendly. We booked the family room, which was spacious and clean with a view of the forest. Fab location: there's a gate in the garden giving direct access to the forest behind; the cycle hire shop and train station are less than 5 mins walk; there's cricket on the village green and of course the Forest of Dean is beautiful. Ask for a table to be reserved for you if you want to eat at the pub. Dean Forest Cycles just round the corner have a wide range of bikes - hire an e-bike for the day. It's brilliant! No effort at all. The Family Trail is traffic free and takes you past Beechenhurst Lodge which serves food all day. Excellent area to explore and The Fountain provides a great location to access and view the lovely forest of Dean. If anybody wants to take the opportunity to stay in this area of outstanding unspoilt English countryside do so. Very friendly and helpful owners and staff. Just everything about The Fountain was excellent. Highly recommended. Very welcoming and friendly. Felt like I’d been before and knew everyone! I was here on business so didn’t do anything except go from The Fountsin to the Venue and back again. But I’d recommend having a drink at the fountain and having a meal! The ambiance is great and despite being a lone traveller I didn’t feel odd being alone as everyone was so friendly! Great for dog owners too! Great location close to lots of local attractions. Staff very friendly and welcoming. Food excellent. Will be looking at staying again in the future. Great stay. Perfect location. Staff were attentive and polite. The breakfast was excellent and of high quality. The rooms were spacious and comfortable (although the beds creaked a bit!) and, despite being above a pub, generally quiet. All in all a very pleasant enjoyable stay. The steam trains were awesome. Bring mountain bikes, or hire them nearby. The scenery is great. Walking boots are a must. Eat in the Fountain. Take a ride on the railway. Visit Clearwell Caves, Hopewell Colliery and the Dean Heritage Centre and take a few good walks. Comfy and enjoyable stay. Nice being able to eat and have a drink where one is staying. We returned because we liked it so much last year. Nice rooms, clean and comfortable. Good beer and excellent food at a reasonable price. We will stay again next year! We used it as a staging post between two places so didn’t get to know the local area. We have holidayed nearby at Symonds Yat though and live the Forest of Dean in general. This was the second time we’re stayed here and i just cannot fault the place, nothing is to much trouble and everything is spot on, the room,food and staff are first class. We are already looking at dates for next year. Well done. Kevin,Julie and the dogs. 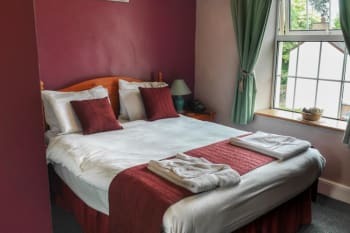 This is an ideal place to stay in the forest as you are within walking distance to many things to do the steam train is just across the road , cycle hire and many walks or mountain biking in the forest are on your doorstep. Great 2 night stay with friends. Friendly staff, good standard of accomodation, good pub food and drink. Really enjoyed our stay. Perfect for mountain biking at Cannop about 15 minutes cycle away on a track/. Booked the Inn for a one night stay with my 2 young children for a visit to the Forest of Dean. The room we stayed in was immaculate and very clean, tidy and comfortable. The staff were without exception welcoming and very friendly. We had our evening meal and breakfast at the Inn and food quality was very good and thoroughly enjoyable. During our stay we visited the Pedalabikeaway cycle centre and did the Family Trail which was great and suitable for all ages, we also visited the Tree Top Junior Go Ape at Beechenhust which was brilliant. Lovely location, the room had everything we needed and the service was great. The food was excellent too. Exceptional, truly exceptional. We stayed twp nights and neither of us can find anything negative to say! Spotlessly clean, ALL staff very helpful, food splendid. We cannot recommend it higher. We will be back! Thank you for a very enjoyable short break. Lots of walks locally. The Forest of Dean railway is well worth a visit. Very friendly staff who made us very welcome. The food was excellent and presentation was first class. The room was very comfy & homely. Ideally located for the Forest of Dean and all activities. Lovely staff and hostess. Good food, nice rooms! Ride the train, walk the sculpture trail,visit the heritage centre. My 4th stay, so comfortable and welcoming. 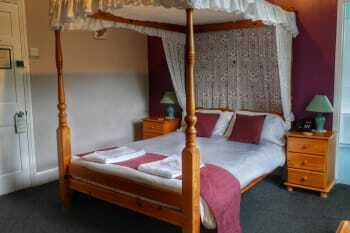 The rooms are lovely, comfy beds and big fluffy towels with lashings of hot water. Nice touches with bottled water and shortbread biscuits to have with a cuppa. Oh, and fresh milk readily available too. So thoughtful. Michelle and all of her staff are so kind, thoughtful and so helpful, like remembering if you want extra hot water with a pot of tea. Being vegetarian I was offered plenty of choice/suggestions off the menu, a big plus. Thankyou. And talking of breakfast the porridge is delicious and you don't feel rushed, a very pleasant start to the day. And my dog was able to stay with me at breakfast having a table laid up in the bar. Another big thankyou. The Fountain Inn is super dog friendly, bowls of fresh water and a fire to laze away the evening by, doggy heaven. Check out the steam train, fabulous, and Parkend station is just two minutes walk away. Pretty villages all around, plenty of walks and the back of the Fountain has lovely walks into the forest (you may even see a wild boar). Chepstow castle (dog friendly) is very easy to get to (spacious car park), and from there go onto Tintern for the Abbey (also dog friendly), lovely shop, pub across the road, and walks along the river Wye..
Food is quite magnificent. Staff extremely friendly and welcoming. Very friendly and obliging staff. Cheerful atmosphere. Busy with local trate as well as visitors. Very nice breakfast and great food in the evening too. Made us and purchase dog very welcome. Very good location for exploring the Forest of Dean. At the top end ofor the forest of Dean steam railway. Bike hire just round the corner with a good cafe too. Another super weekend. Will keep going back. Great place to stay, friendly staff, excellent food. I'll be back. Ride the train , go to the sculpture trail, visit the Heritage centre and Lydney Harbour. Just general really - the forest is a delight, apart from damage done by wild boar, which hopefully can be brought under control. Overall a very pleasant area to visit and "chill out"
Warm welcome and friendly, helpful staff. Very good bar and restaurant. 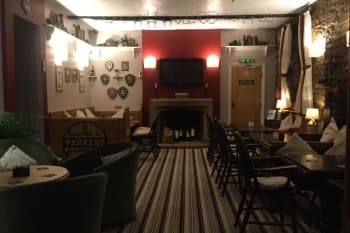 The pub is very friendly, the staff always ready to help ,the food was 1st class ,our room was a good size and warm and cosy everything as you would expect . Excellent hotel,very friendly staff and superb location as well. Fountain Inn is an excellent choice of place to stay in the Royal Forest of Dean. The staff are friendly and the drinks and food are excellent. The Inn has been improved over recent years by Alan and Michelle and is the best public house/inn in the Forest this year. As well as the Fountain Inn there are a number of other pubs and inns in the area. 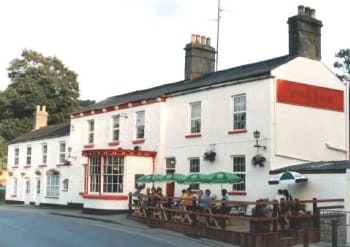 These include the Miners Arms at Whitecroft, the Rising Sun at Moseley Green and there is also an excellent India Restaurant in Lydney, called the Saffron Balti - bring your own alcoholic drinks. This was a second visit by us (previously recommended by our son. Staff very friendly and helpful and we would love to return. 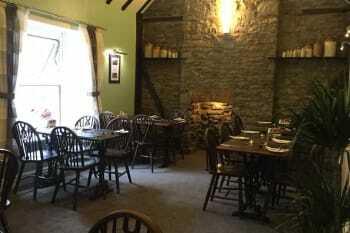 We found it very convenient to eat at the Fountain Inn as the food was so good and the service excellent. Food is wonderful. Staff lovely, friendly, and very helpful. Can t thank you all enough for the help you gave me personally and you looked after the group as a whole brilliantly - breakfast times you were especially patient!! Wish we had had more time down there and can t wait to revisit. Very enjoyable weekend with some friends. Spotless rooms,excellent full english both mornings. Ate there both nights too. Generous portions and freshly cooked, steaks on the Saturday were particularly good. I thought the young bloke behind the bar was outstanding too, very polite and efficient.highly recommended. We stayed at The Fountain when attending a wedding and couldn't have asked for more. The location is lovely and was perfect for our wedding weekend. The pub has a great atmosphere and serves proper pub grub which was just what we needed after a long drive! Our room was comfy and cosy and the staff were so friendly and accommodating, even sending an iron and board to our room to save the wrinkled wedding wear. Thank you so much for a super stay! Wifi only available in the bar and there's no phone signal either so no 3G or 4G etc but on my visit I was informed that wifi in the rooms was on the way in a few weeks so hopefully sorted now. This was my 3rd stay, with my two small dogs. The rooms are lovely, all of the staff are very friendly and chatty and as always made me feel very welcome. The food is delicious and beautifully presented and I'm looking forward to my next stay. What was great is that I could have breakfast in the bar area so that my dogs could be with me. Very dog friendly village, on the edge of the Forest of Dean, with lovely walks. The steam train station is just across the main road, is also dog friendly, they have their own tickets at £2 each and can go into the small railway museum at Norchard too where there is also a lovely cafe with plenty of outside seating. Tintern, with the beautiful Abbey ruins, is just 30 or so mins drive away. Excellent overnight stay and good food at this welcoming Inn. Unfortunately, outside phone calls cannot be made from the bedrooms and there is no mobile signal in this area. However, the staff are happy to provide the use of their phone for necessary calls. A lot of walks you can do, plenty of things to do around the area. Absolutely fabulous! A family run hotel were every member of staff are all great local people with time to chat and helped make sure we enjoyed our stay. We booked a twin room and had the benefit of being on the ground floor with two doors to give direct access to the street and to the hotel reception (perfect if wheelchair access is needed). The hotel and The bar, restaurant, bedrooms and outdoor areas all so nice. An extra bonus is that the historic Dean Valley railway is next door. We want to visit again and allow more time to enjoy our stay even more. Parkend is a lovely village set amongst forest areas. Endless activities for any everyone and yet its all so peaceful and un-commercialised. Lovely place to stay, staff was so friendly. I have taken one star off facilities because the wifi doesn't work in the rooms. We are in the EE network and we didn't have signal either - not their fault of course. Apart from that, location is fantastic, we have 2 meals plus carvery there on the Sunday which was excellent. Highly recommended and we are hoping to stay there again soon. Wifi only works on bar, so don't plan to use your tablet/smartphone much while in your room. Carvery was excellent and only £9 per person. I have already given you an excellent review on trip advisor. Very little to criticise. Cleanliness, food, tea and coffee making facility, bottles of water and other little extras all appreciated. The staff were excellent - equal to anywhere we've stayed.. The accessibility to Whitemead camp was perfect for us as we had family staying there.We we're aware of some traffic noise but that couldn't be avoided.The food was very good,one of our group had a tough steak and gently complained she was offered a coffee or dessert etc but declined, the complaint was handled very well. Two of our party booked an extra night so that speaks volumes. The weather wasn't marvellous but there's quite a lot to see around the area. Symonds Yacht is a nice visit. We had a stop at Taurus craft centre for coffee and a browse. Lovely area for walks and cycling. Thank you so much for your lovely review, glad you enjoyed your stay with us and hope to welcome you back again some time. A very well run friendly pub with excellent value accommodation and good food. Thank you so much for taking the time to leave us a review, glad you enjoyed your stay with us. good accommodation,fine food, great atmosphere, friendly staff. Dean steam railway is worth a visit. Thank you for your review, glad you enjoyed your stay. The service was personal and excellent, the food and drink were excellent. Eat in at the Fountain Inn but check beforehand to see if they expect to be busy at the time you intend to eat. The local cycle hire place serves lovely local ice cream, homemade cakes and cream teas. It's also a good place to hire a bike for a ride in the Forest! So glad you enjoyed your stay and the food too. Lovely friendly Inn - excellent staff . Landlady so helpful - couldn't do enough for us . Really looked after us well . The downstairs disabled room was ideal for our needs. Certainly recommend this delightful Inn. Excellent stay for Dean Forest Railway - just across the road . We had a lovely cream tea trip on the steam trip - definitely worth a ride ! Right on the edge of the Forest of Dean - not far from the amazing Severn Suspension Bridge ! Just on the Welsh border - lots to see ! Traffic speeds along road in front of hotel so rooms can be very noisy if you are at the front. All the windows in the Inn are double glazed to prevent traffic noise, I imagine you had your windows open as it was very warm during your stay. So sorry you were disturbed by it and hope it didn't spoil your visit. Very welcoming, lovely staff, plumbing was slightly below expectations based on the rest of the hotel which was excellent. We were recommended to stay, and would certainly recommend others to do so. Plenty of places to visit and loads to see, could easily have stayed longer. Lovely to find a dog friendly hotel that is located close to so many attractions. 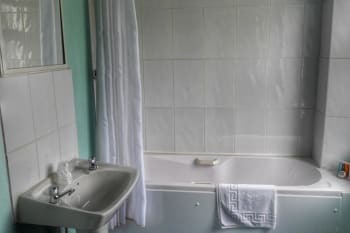 So sorry I had no idea you had any problems with the plumbing during your stay, I will certainly look at your reservation and work out what room you stayed in so we can look into it so no one else had a problem, hope it didn't spoil your visit but thank you for bringing it to my attention now. 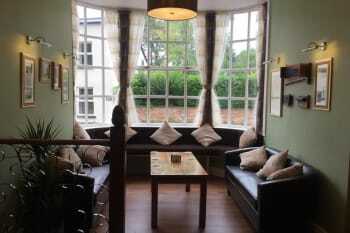 Lovely inn with modern facilities, yet retaining the history in the building. The food, especially the included full breakfasts, were consistently tasty and well cooked. Staff were friendly and welcoming. Had a lovely stay. So glad you enjoyed your stay with us and thank you for taking the time to leave such a lovely review. The room was very comfortable and the pub welcoming. Ideal location for visiting the Forest of Dean. Thank you so much for leaving a review, glad you enjoyed your visit. Thanks to Michelle and all the staff for a brilliant stay ,we were looked after so well and nothing was too much troubie .The room was lovely and food delicious.We will definitely be back ,thanks again. Excellent. Notes for improvement might include variable water pressure when showering and perhaps the room was getting ready for redecorating. We especially appreciated the power socket with built in USB. To be honest, it was a base whilst doing other things so we didn't use local attractions. We did find nice footpaths through the woods on an after dinner walk and thought it would be a nice area to explore so will certainly consider returning. Thank you for bringing the problem with water pressure to our attention, we will certainly look into making improvements. Very comfortable & clean throughout. Enjoyed the real ale on sale in the bar. First class, plentiful breakfast. Looking forward to staying at The Fountain Inn again. The cafe & ice cream cabin at the cycle hire centre, just round the corner from The Fountain Inn is well worth dropping in for a tea, coffee or ice cream. Food very good,did worry about poor sheep in the hedges and roads. Thank you for your review, the sheep in the Forest of Dean are free roaming and used to wandering so nothing to worry about as they are looked after. Glad you enjoyed your stay. Thank you very much for your review, glad you enjoyed your stay. Excellent staff and service, always make you feel very welcome. Thank you so much Mr Kaye, lovely to see you again. Michelle and her staff made us so very welcome. Very dog friendly. Food was very good and well presented. Wonderful room, Room 9. Separate to Inn but you have a key to front door. Food very good and pkentiful. Lots of choice and catered for dietary restrictions/tastes. Beautiful garden to enjoy the sunshine. Friendly welcome and service. They provided bottled water and decaff tea etc for the room too. Packed with breathtaking walks, including the amazing Sculpture Trail. Plus family centred or more adventurous cycle tracks in the area. Cycle hire available in Parkend.Steam train runs nearby. Taurus Crafts and beautiful plant nursery Pygmy Pinetum nearby. Parkend has a fantastic Amateur Dramatic Group, check them out for their truly fantastic productions. Thank you for such a lovely review, so glad you enjoyed your stay with us, Michele. Basic but clean. Got everything you need and is good value for the rate of an overnight stay. We stayed one night for a near by wedding and it worked out very well. The steam railway is very close to here, so a good stop off point. Thank you for your lovely review, glad you enjoyed the 4 Poster room and hope you see you again some time in the future. Thjs was my third or fourth stay at the Fountain. I would not return if I wasn't impressed by the establishment and its staff. That said, breakfast was a bit chaotic, on all but the last day of our stay (when we appeared to be the only guests) but I think this was largely the fault of guests not adhering to their stated timings, rather than the staff of the inn . As a former inhabitant of the area it is difficult to single out any particular attractions. However the Dean Heritage Railway and the Heritage Centre at Soudley are essential 'ports of call' for any tourist. You are absolutely right, we always try to spread out breakfast times over the morning so guests get the best possible service, unfortunately during your stay all 5 rooms decided to come at once. Sorry it spoiled your stay, we really did try our very best to please everyone under the circumstances. As ever, friendly and welcoming. Great value for money. Very hot weather meant we had the windows wide open which meant a bit of traffic noise. Maybe a fan in the room? Brilliant short break at a favourite inn. Too many things to do to mention but the local walking and cycling routes are superb. Lovely stay, fanstastic surroundings. Staff were very friendly. No issues with a late check in or an early start. Food was very good. Very welcoming and friendly. Good atmosphere in the bar. Large very comfortable room. Our dog was welcome. Good food. Thank you for your lovely review, so glad you all enjoyed your stay with us. Staff were excellent as always. Food also very good and there is always good ale. Rooms very clean and comfortable but this isn't a 'fancy' establishment. It's excellent for a quiet, comfortable stay, with good food and ideal for a relaxing evening. If you want excitement, this isn't the place but after a long journey and a hard day I just want a good pint, a good meal and pleasant service. That's what you get. Lovely to see you again and thank you for taking the time to leave us a review. Convenient for our family visits. Clean and comfortable rooms, attentive and friendly staff. Exceptionally friendly people - sorry we couldn't stay longer. For birders, Nagshead RSPB Reserve close by. Excellent place to stay to explore the Forest. Good parking. Great food and beer. Adjacent to the station for travel on the heritage steam line. Food is absolutely superb. I reccommend the chef's pie. Thank you so much, glad you enjoyed your visit and we look forward to welcoming you back soon. Superb break - we were there for a short mountain bike break at the Trail Centre, and the Inn was a perfect base. The rooms were fine, the food great and the staff were brilliant! friendly, attentive and even allowed us to store the bikes in the cellar overnight. We would certainly recommend the Inn for this type of break and will return next time we use the Forest. Great value as well. Thank you so much, so glad you enjoyed your visit. Had a lovely time here, excellent service, lovely room and nice meal, only downside the mattress was a bit lumpy!! Thank you for telling us about the lumpy mattress, we rely on feed back to improve and as a result we have replaced the bed, glad you enjoyed the rest of your stay. Warm welcoming and great kindness Nice and helpful staff . À very push place. Very comfortable place to stay. Rooms spacious, very clean, comfortable bed and food is good. Staff are excellent. When I'm in the area, this is my choice for somewhere to stay. I prefer it to other bigger hotels. Always try the guest ale in the bar - it's never failed me yet. Glad you enjoy staying with us and thank you for taking the time to leave us such a nice review. A really friendly, family run inn, offering all of the home comforts and great hospitality which corporate hotels just cant match. Park the car up and walk, cycle and explore for the whole weekend. You can visit and see so much all from Parkend. Friendly and welcoming staff, comfortable lounge area. Thank you for your comments, glad you enjoyed your stay with us and look forward to welcoming you back in the future. Very friendly and helpful. Relaxed atmosphere and good interaction between staff and also between staff and customers. Appreciate the safe storage of our bikes. A drying room would have been helpful for us (particularly for our boots) as we were mountain biking and the weather was not the greatest. This is not a criticism, but would have been useful. Lots of off road cycle/walking trails on the doorstep including a mountain biking trail centre and family cycling routes. Great place for bird spotting and steam railway enthusiasts too. Thank you for taking the time to leave us a review, glad you enjoyed your stay. We stayed with our dog and were given a ground floor room with own front door. 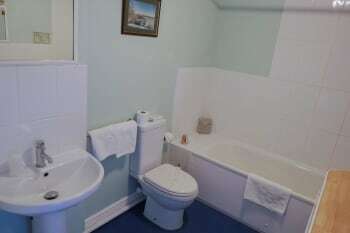 I have mobility issues and the room was fully equipped with wet room and disabled facilities. I was very impressed with all of this and clean room with everything we needed. A disabled parking space was also available right outside the door! All excellent - thank you very much! Lots of walks and interesting geology and industrial relics to discover in the area. Thank you so much for your lovely review, glad you enjoyed your stay with us. Very warm welcome, comfortable quiet room and adequate facilities. Very pleasant staff, excellent food, wonderful ale and price was very reasonable. If you want a bustling place with lots of gimmicks go somewhere else. But, if you want somewhere comfortable in a nice area and just to chill out - the Fountain is highly recommended. Don't just put the village in the SatNav 'cos you'll possibly have problems finding the pub; use the post code. Try the guest ale. Fantastic family pub with really friendly staff and great food. Spotless accommodation. Our second visit and certainly not our last. Perfectly situated for access to the Forest of Dean. The pub is only a few hundred yards from the family bike trail which takes you directly to the mountain bike trail centre. The pub has a bike wash and secure storage and a great selection of beers to rehydrate after a days riding. Thank you so much for your lovely review, glad to hear you enjoyed your weekend with us, hope to see you again in the future. Thank you for taking the time to leave us a review, so glad you enjoyed your visit. Excellent staff. Couldn't do enough to make our stay successful. Will be back very soon. Thank you for taking the time to leave a review for us, so glad you enjoyed your stay, we look forward to seeing you again soon. Lovely family run hotel. Food is gorgeous. Staff friendly and helpful. Very clean and comfortable. Good location for any activities in the Forest of Dean. Local history is very interesting - mines, railways, and metal working. Thank you so much for leaving us such a lovely review, glad you enjoyed your stay with us. Unfortunately the mattress was very noisy - try lying down on it and then turning over. Apart from that our room was excellent with that storage cupboard to tidy away all our photography equipment, reference books etc. We were in Park End for the wildlife so the little woodland behind the car park was great for us to see dippers. Thank you for your feed back about the bed, we have since replaced it so no more squeeking ! 3rd stay with them and shall continue to return. Standards are maintained at all times. Bar meals are of good quality with huge portions maybe a bit too large for some. Thank you so much for taking the time to leave us a review, glad you enjoyed your stay. Thank you for your feedback regarding the portion sizes, I will pass it on to our chefs. A beautiful quiet location right in the woods, with deer out the window. The room was clean and lovely. Restaurant food excellent. this was our second visit. Pleased to say that the standards have not dropped. Service was as always fantastic .landlady and all the staff are most accommodating and helpful. Dogs are very welcome and allowed in the bar area. Thank you so much for your lovely comments. We really appreciate you taking the time to write your review and are so glad you enjoyed your stay with us again. Look forward to seeing you in the future, Michelle, Alan and The Fountain Inn Team.